The Department of Environmental Quality (DEQ) was created by Executive Order in 1995 as the state’s principal regulatory agency for air, land, water and other natural resources. With a full-time staff numbering 1,679, the department monitors air and water quality, administers state and federal discharge and emissions permits, enforces public compliance with numerous environmental requirements, and promotes pollution prevention. By creating the DEQ, then-Gov. John Engler sought to consolidate regulatory functions previously administered, along with various recreation and conservation programs, by the Department of Natural Resources. Proponents say the re-organization eliminated a severe backlog of environmental permit applications, streamlined bureaucracy, and improved regulatory accountability. Further improvement is possible. 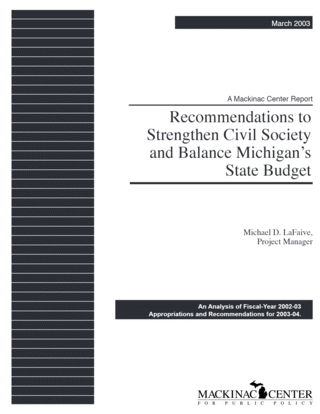 A proliferation of duplicative environmental regulations continues to impose ever-greater burdens on both the DEQ and the public, exacerbating Michigan’s budget crisis. State government cannot afford to duplicate environment-related services that are already provided by businesses, private landowners, or environmental groups. Neither can they afford to undertake programs that yield marginal benefits. Priorities must be set to maximize environmental improvements. The programs identified below fall into one or both of these categories.